Hi everyone! 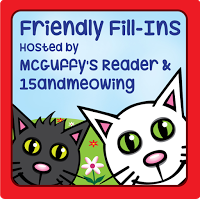 Time for The Friendly Fill-Ins, be sure to add your link at McGuffy's Reader. 1. My guiding word for 2018 is _____________________. 2. A house is not a home without ________________________. 3. I look forward to this year. 4. I really need to , because . 1) My guiding word for 2018 is improvement. I have found my motivation for self improvement and I am working with it. I do not have to be perfect but I would like to be better. 2) A house is not a home without a pet. I do not know what I would do without my furry little angels. 3) I look forward to Argos season this year. 4) I really need to study more, because I would like to finish school faster.